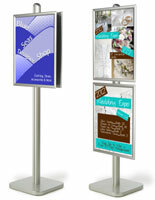 Media Size: 22" x 28"
Place Graphics Vertically or Back to Back! This snap frame stand looks elegant in any floor plan. 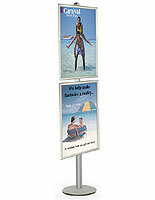 This Snap frame stand has two large clip frames and is 8 feet tall! 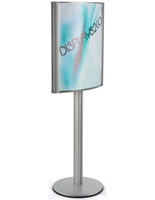 Tall display stands command attention. 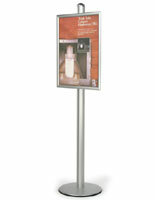 This sign display, snap frame stand, holds two 22"w x 28"h poster frames. The poster frames have snap open features, great for frequent graphic changes. 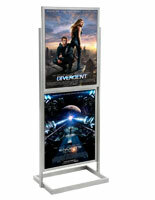 The eight foot display stand is sturdy, with durable aluminum construction. 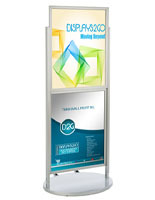 This snap frame stand is most effective in large venues like exhibition halls, hotel lobbies and large retail stores. 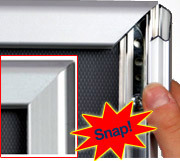 To change graphics, simply snap open all four frame sides, place the print media under the clear plastic lens, and snap the frame sides closed. 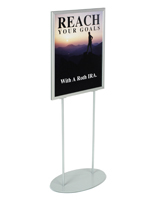 Non-glare clear PVC plastic lenses are provided to protect your graphics.This snap frame stand has a sturdy base for ultra stability. This snap frame stand is also height adjustable. Poster frame installation and height adjustment is easy using the screws on the connector plates at the back of the poster frames. 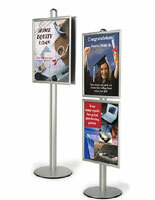 This snap frame stand is extremely effective for high impact advertising. 23.8" x 94.0" x 17.5"